Once you have made the scan, you need to adjust the image to make it look right. This page outlines how to use Lightroom to optimize your camera scans for negatives and positives. You can use your raw file processing software to optimize your camera scans. If you are scanning slides or transparencies, nearly any raw file processor will work. If you are scanning negatives, the software must have the capability to invert the image, which is how it gets changed from negative to positive. 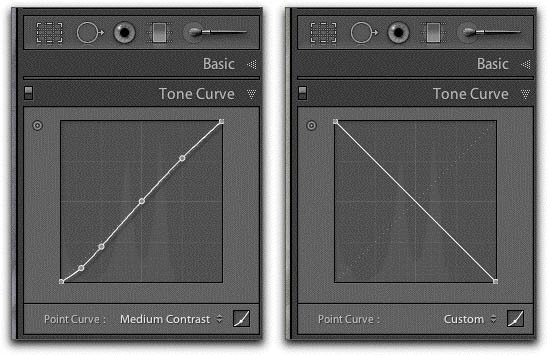 Figure 1 shows the point curve in Lightroom 3 that offers the ability to invert the brightness. You can find this same tool in Adobe Camera Raw. Slides are the most straightforward camera scan images to process. It is very similar to the image adjustment you do to your regular digital originals. You can use the white balance tools to control general color, and the tonal controls such as Exposure or Blacks to make tonal adjustments. One of the most common needs in working with color slides is to open the shadow areas of the image, since these often pick up additional contrast in any reproduction process. This can often result in the loss of detail in the shadows of dark skin, for instance. The Fill Light command in Lightroom and Shadow control in Aperture can do a good job with this task. It is often possible to make very good versions of your images quickly, without needing to do any work in Photoshop. Figure 2 shows how the tools in Adobe Lightroom can be used to optimize camera scans of slides. It is possible to make excellent positive images from camera scanned black and white negatives.The image must first be turned positive, which can often be done with a single setting for an entire roll. If the exposures on the film have too much variation for a single adjustment, individual images can be further adjusted on a rapid basis. The non-destructive nature of parametric image editing allows for a quick proofing of a large group of images, without prohibiting readjustment at a later date. This allows the imager the ability to proof quickly, and create optimized images once a need for a higher quality version arises. In many cases this will be the optimum workflow - shoot and proof quickly, and optimize as higher-value needs present themselves. The movies in Figures 3 and 4 outline both of these procedures - quick proofing for an entire roll, and careful toning of a single image. Colour negatives are the hardest film images to camera scan due to the difficulty of transforming the colour in the negative to a positive. It's possible with a little work, however, to make a good conversion. There are a couple of steps. The light source for the copy should be filtered to remove the orange cast of the film base. This puts the colour within the range that a digital camera is optimized for. This may be most easily done by using colour compensation (CC) filters on the film stage. If you are using a bench system described above, you can probably dial in the proper filtration. Here is one methodology for making sure you filter out the film base. The movie in Figure 5 outlines an approach to processing the colour negative scan. Just as with the black and white, the image is turned into a positive by flipping the tone curve upside down. Once that has been done, you can use color controls to adjust the colour. Again, the controls will work in reverse if you are using software that is meant for conventional digital camera files. This makes the process much more difficult than working with black and white, since the colour will now work in reverse as well. It is possible to take camera scans of colour negatives into dedicated scanner software, such as Silverfast. While this may not present a fast or convenient workflow, it will allow the use of custom colour curves that have been built for different film types.